Students solidify a strong foundation of skills, sound work habits, and an early understanding of who they are as learners. The 9/10s program focuses on developing a community of learners, who are well-prepared for the challenges of Upper School. The year begins with an emphasis on building community as teachers and students establish routines, goals, and plans for learning. The core social studies curriculum in the 9/10s year explores the relationship between people and the environment through an interdisciplinary lens. The year begins with a study of food systems. Students learn about food insecurity and explore world biomes and environmental advocacy efforts to protect habitats and natural resources. In the spring, 9/10s study ancient Egypt, beginning with its geography and exploring the Nile River’s essential role in supporting civilization in ancient times. This unit culminates in the 9/10s play, which students create and perform at the end of the year. A timeline and discussions of historical and cultural perspectives bring the concept of “long ago” into focus. A study of the Egyptian people and class groups includes discussions of the afterlife, the process of mummification, and the significance of gods and goddesses. Integrated into these studies are nonfiction readings, creative writing, and a self-directed research paper, as well as the year-end play about ancient Egypt. The Language Arts curriculum focuses on building a community of readers. Teachers and children offer input to build a classroom library. Novels, poetry, picture books, and informational texts are read aloud. Students choose books for independent reading, and a core focus of students’ library use is on nurturing a love of reading for reading’s sake. Student-led book groups in the spring build on the reading comprehension students have developed in the fall to focus on strategies for rich conversations about literature. Writing workshop begins by teaching students to use the writing notebook and provides them with tools for revising their work before publishing. Students share their work with each other and their teachers to receive feedback. 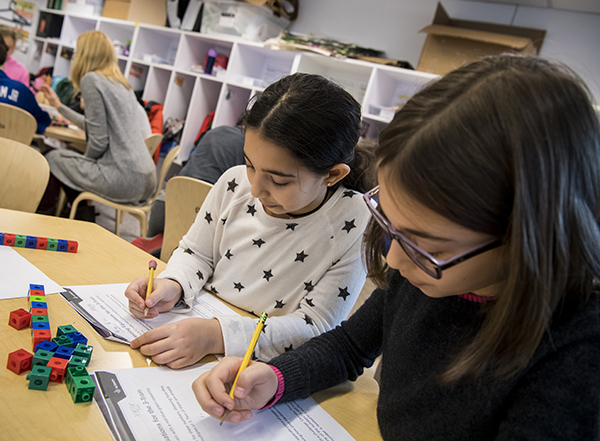 Students master strategies for improving content and learn the mechanics of writing, such as spelling and grammar, as they explore different styles of writing and publish their work. 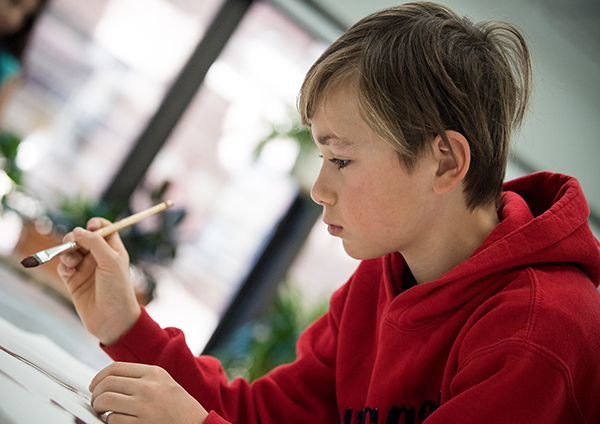 Library work helps students build their information-finding skills to become increasingly independent library users. 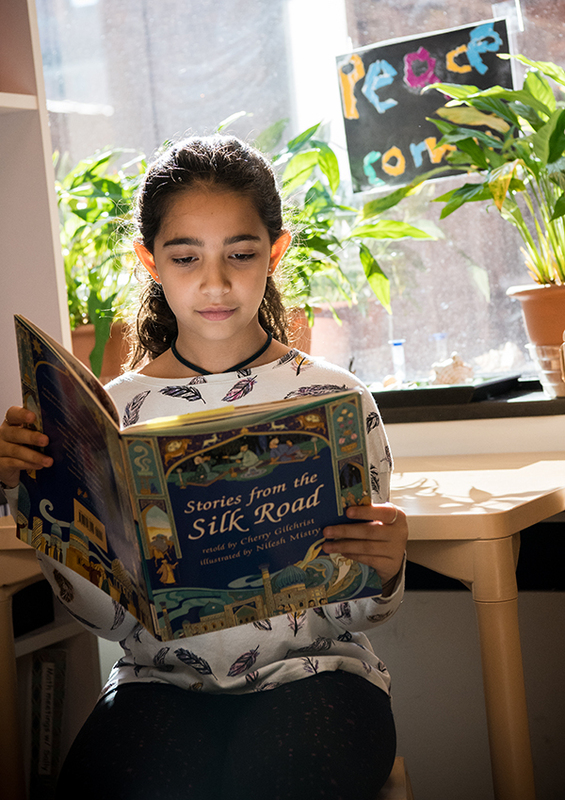 Students also have an opportunity to hone their critical reading skills by evaluating picture books for the Irma S. and James H. Black Book Award, which is presented by Bank Street’s Center for Children’s Literature. For this annual award, children in the 8/9s and 9/10s select four finalists after evaluating 16 current picture books, guided by the librarian and their classroom teachers. The 6/7s and the 7/8s read the four finalists and vote, along with students from hundreds of schools around the world, on the winning book. 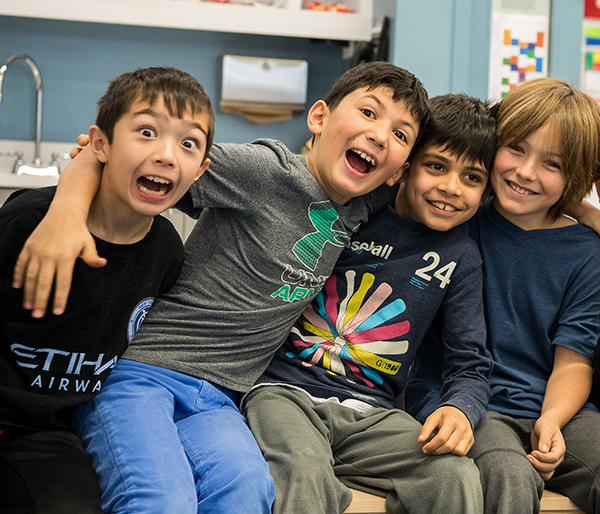 In the Spanish program in the 9/10s, students become actively involved in their language learning process through theme-based units that focus on culture, content, and context. Thematic units offer connections to the core curriculum, with a focus on climate and food. Writing story problems and using array models to represent multiplication and division situations. Collecting and analyzing data in graphs, and practicing how to make a rational argument supported by data. Broadening their understanding of addition, subtraction, and place value using large numbers, writing story problems, and practicing different strategies. Studying 2D and 3D geometry, fractions, and decimals. An algebra unit focusing on helping students study number sequences to discover patterns and relationships between numbers. Science in the 9/10s year starts with an exploration of who scientists are and what they do, and begins with an investigation of ecosystems. Students set up a terrarium by planting grasses and later introduce crickets and snails. The ecosystem is expanded to include an aquarium environment. Students observe the relationship between organisms and simulate the effects of pollutants on the environment. Students enhance their investigation skills by exploring measurement and refining their skills of measuring in inches, centimeters, and millimeters. In the spring, students explore different forms of energy—light and sound—and experiment with magnets and electricity, exploring circuits and learning how to use electricity to construct an electromagnet. The spring Human Growth and Development for 9/10s reviews the changes bodies go through during puberty. The Middle School technology program is developing quickly. The 9/10s classrooms use a range of technology for instruction, documentation, and collaboration. Art in the 9/10s begins with an introduction to symmetry and design in painting and continues with painting from observation and painting to tell a story. A clay project of a figure supports children’s growing desire for realism. In shop, students engage in projects that allow them to explore the nature of a “self-portrait” and express their sense of their inner self. Shop projects also present technical issues that offer students opportunities for creative problem-solving and skill building. Students spend the year making fictional films. Students storyboard and work in groups to direct, shoot, and act in their own original movies. They learn rudimentary editing techniques using iMovie and explore sound and special effects techniques. 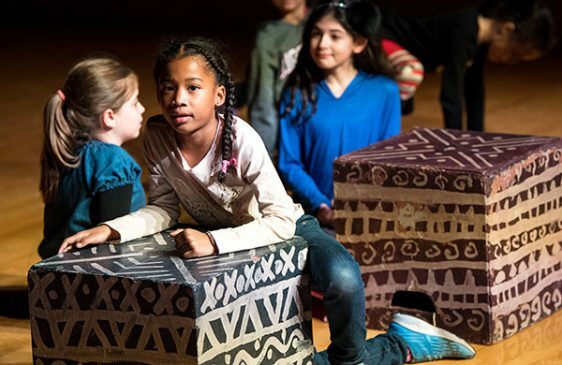 Theater games, group pantomime, and improvisation sessions interspersed into the film units lead into the Social Studies play, in which dramatic play helps students explore Ancient Egyptian culture and myth, eventually leading to the end-of-year performance. 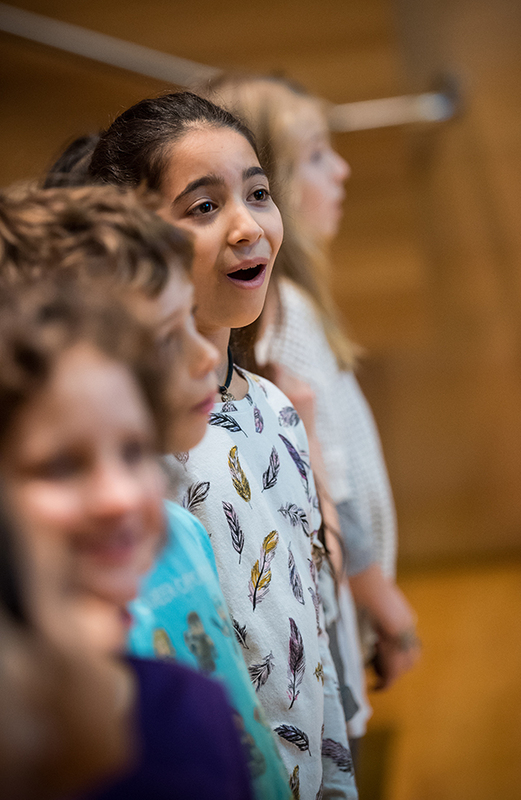 Singing continues to be the foundation of the music curriculum and all students participate in weekly chorus rehearsals. Music literacy and instrument playing build on the recorder playing and reading skills acquired in the 8/9s. Students gain more fluency in reading and ensemble playing and explore instruments such as xylophones, metallophones, and glockenspiel, as well as percussive instruments and hand chimes. Movement/folk dances help students discover the connections between patterns in music and physical movement, while learning the art of collaboration, self-regulation, and listening. In music appreciation, students learn about jazz, including its history, styles, and notable musicians. For 45 minutes, three times a week, students meet in the gym and on the rooftop play area and learn to develop their strength and endurance through age-appropriate activities that provide the basis for a lifelong appreciation of movement, play, and fitness. The emphasis of physical education classes in the 9/10s is to develop social skills and appropriate team play. 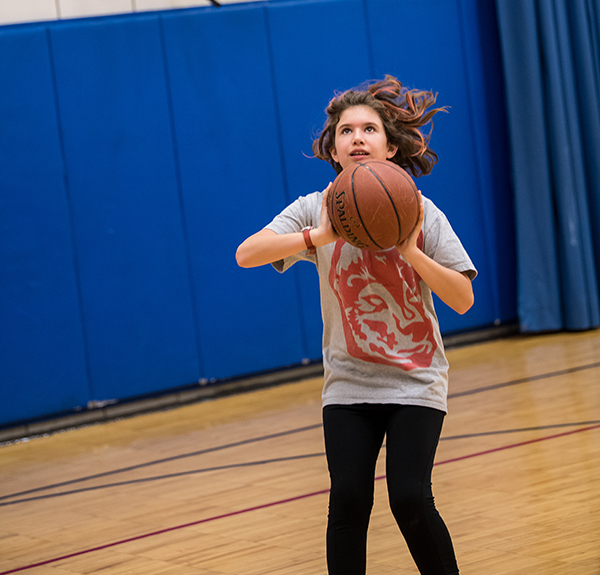 Students are introduced to skills and equipment and participate in a variety of team sports, including lead-up games in team handball, football, soccer, basketball, volleyball, and softball. Students participate in stretching, aerobic, and upper-body strength exercises to increase fitness and prepare for fitness exams. Students also play competitive games and recreational tag games for a balanced approach to group play. In the 9/10s year, the Racial Justice and Advocacy curriculum focuses on community conversations about issues such as classroom fairness and peaceful conflict resolution and incorporates activities within the Social Studies and Human Growth and Development units.